Iktara (Ektara) is a regular string instrument of wandering bards and minstrels from India and is plucked with one finger. We are offering our clients Iktara Instrument made of good quality wood and painted with artistic designs. We are majorly looking for foreign queries. We are a reputed entity in the industry, actively engaged in offering an optimum quality range of Wooden Gopichand. We are successfully meeting the varied requirements of our clients by providing the best quality range of Ektara Indian Musical Instrument. We manufacture and supply different types of string instruments which include Ektara. 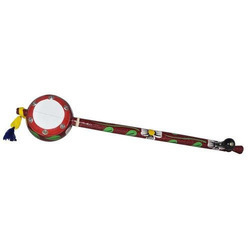 This musical instrument is widely used in India and other countries like Pakistan and Egypt. In the ancient times, the Ektara was played by minstrels who plucked the strings with one finger. Ektara comprises of a head, a long string and a neck. ektara or dotara specially made, highly polished top performance. We are the leading manufacturers and exporters of Wooden Goopi Chand Instrument. This is specially designed by the wooden skilled experts to maintain the quality. Music has its own place in everyone’s life, so these instruments are designed effectively. It is made using the wood as well as steel. This is available in several sizes as per the client requirements and specification. Designed in adherence with industrial quality values, the provided range of Ektara is carefully inspected against different parameters of quality. We are remarkable entity, engaged in offering superior quality Ektara Instrument. - Ek means "one" and Tar means"string". The Ektar or -as it is often called - the Gopi Yantra, is a simple instrument that is mainly used in Bengal as a folk instrument. In some places this instrument is offered in souvenir shops in a very cheap qualitiy. The quality offered by us is much better than that.